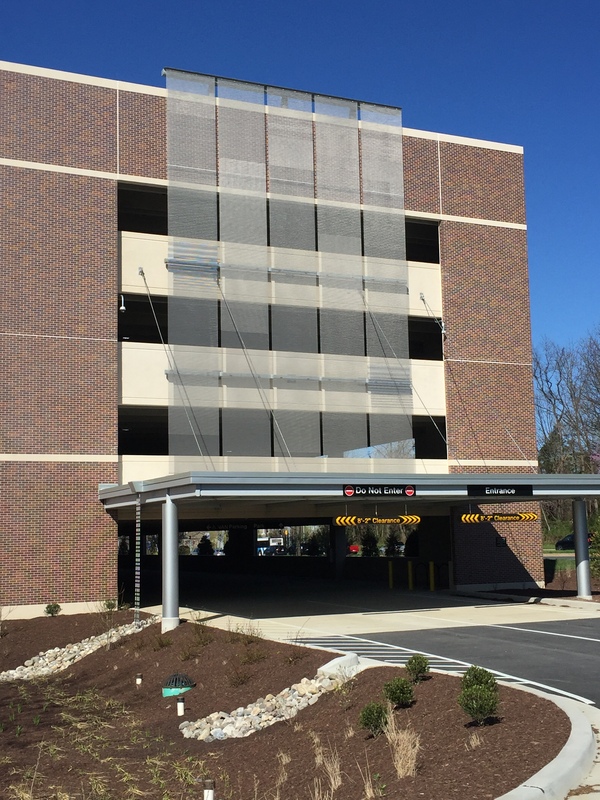 A combination of three stainless steel mesh patterns woven by Cambridge Architectural envelop the exterior facade of the new 700-space parking garage at The Universities at Shady Grove in Rockville, Maryland. The $20 million project, completed this spring, is expected to be one of the first parking facilities in the world to achieve Green Garage Certification under the Green Parking Council’s new rating system. Using Cambridge’s Build-A-Pattern service, Cambridge’s project engineers worked with Baltimore-based Ayers Saint Gross architects to create a custom façade design that incorporates more than 31,300 square feet of mesh that helps to promote daylight control and ventilation in the garage. Located at a major intersection at the campus entrance, the garage acts as a billboard for the University according to Daniel McKelvey, AIA, Associate Principal at Ayers Saint Gross. “USG takes pride in being a technology university and wanted the façade to express this ideal,” he said. “Stainless mesh was a convenient way to incorporate a transparent solar veil over the garage to provide a high-tech appearance that complements the precast structure and serves to unify the geometry of the façade. Instead of using a monolithic screen, Ayers Saint Gross’ design incorporates three Cambridge mesh patterns -- Pellican, Mid-Balance and Shade – in combination with punch-outs in the mesh to create aesthetic interest and air flow. Made from recycled materials, the stainless mesh and Cambridge’s Eyebolt attachment system hardware contribute to the garage’s pending “Green” Certification. Cambridge – a participant in the International Parking Institute’s Green Star program for sustainability – uses a cold forming process for the mesh that generates less environmental impact than processes for heat-treated products. The mesh is not susceptible to weather, is virtually maintenance-free and has an indestructible life cycle. Much of the garage’s construction waste was recycled and a significant portion of the garage labor and materials, including the Cambridge, Maryland-manufactured mesh, was sourced regionally. In addition, USG’s new “Green” garage generates onsite renewable energy from the photovoltaic panels and features energy efficient LED lighting. Green Garage Certification is the world’s only rating system defining and recognizing sustainable practices in parking structure management, programming, design, and technology. Founded as a regional center for the University System of Maryland in partnership with Montgomery County, USG brings together nine of Maryland’s leading universities on one campus. 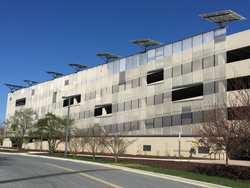 The garage, funded by Montgomery County, is the campus’s second parking structure. It will help pave the way for USG’s Biomedical Sciences and Engineering Education Facility to be completed in 2018. Cambridge Architectural, a division of Cambridge International, is the most experienced full-service provider of sustainable architectural mesh systems for both interior and exterior building applications. As the world leader in tensioned mesh systems, Cambridge Architectural metal fabric solutions lend unique aesthetic appeal, functionality, affordability and sustainable benefits to a variety of structures interior and exterior. Cambridge Architectural offers full system design, engineering and collaboration from concept through installation – in the most challenging building environments and under the strictest budgets. Cambridge Architectural metal fabric systems are categorized by the primary applications they serve, including parking structures, exterior shades, facades, canopies, curtains and others. As a member of the United States Green Building Council, Cambridge Architectural is committed to promoting methods, technology and products resulting in environmentally responsible and healthy buildings. The Cambridge Architectural team develops systems that meet or exceed LEED requirements and provides consultation and direction on a project-by-project basis. Visit http://www.CambridgeArchitectural.com for more information.